Chemical ingredients are often present in sunscreens which are potentially carcinogenic, have hormone-like actions, or are generally irritating to sensitive skin because of perfumes and colorings and other additives. This warrants a little diligence in choosing a product to use, especially for use on your children. EWG (Environmental Working Group) rates cosmetics and other products for safety, and can be a good starting point for researching a topical product. Anything you put on your skin, you are also absorbing directly into your body’s tissues and circulation. Chemicals with hormonal activity can absorb far more efficiently through the skin even in tiny doses, compared to swallowing a substance. This is because the liver neutralizes and helps to clear out excessive or toxic substances when something is ingested orally. This system of protection is largely bypassed when a product is administered directly onto the skin surface. Now, when you smooth a chemical substance over your child’s skin- they have a greater surface ratio, more sensitive skin, and are generally more vulnerable to the harmful effects of hormone disrupting substances than you are. So, if you are using something frequently on delicate skin surface, it is worth your while to research it a little further. One ingredient in particular to avoid is oxybenzone- a synthetic estrogen, which is present in more than half of all sunscreen products. 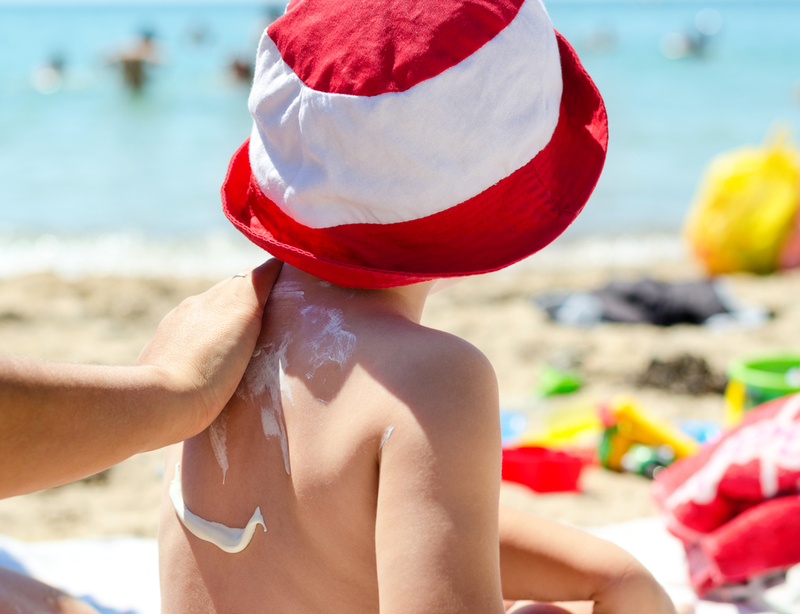 My pediatrician taught me to avoid SPF’s over 30 or 50, because they are very drying to the skin. Also, sunscreen should be applied liberally- don’t be afraid to glop it on. Reapply regularly, especially after being in the water, this goes even for water resistant formulas. So which one to choose? According to EWG’s list- some of the very worst picks include the sunscreens made by Aveeno, Banana Boat, CVS brands, Coppertone, Hawaiian Tropic, and surprisingly- even Alba Botanica. In contrast, some of the best rated include commonly found products by Badger, All Terrain, Ecco Bella, and The Honest Company. And, summertime is ripe for exposure to poison ivy and poison oat or sumac. The best thing you can do is to stock a great big bottle of Tecnu Skin cleanser. You can find it in most drug stores. If you or your child has been exposed to poison ivy, or even when the rash starts to come out- use this stuff and it should stop it in its tracks. It removes the offending oils from within the skin. You can also use it on pets, and to wash clothes. Highly recommended! For natural mosquito repellent, products that contain lemon eucalyptus are the best, Repel makes a great one. And they smell pretty good! It does require frequent reapplication- it will work great for about an hour or so, and then you will need another coat.